There are many types of orchid pots. The most common type is a plastic pot. 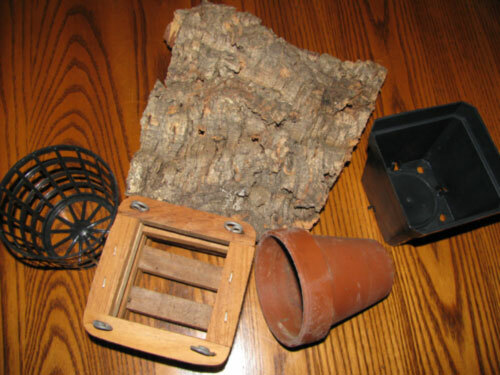 These are easy to get the plant out of either for repotting or to inspect its root system. Their drawbacks are that plants can tip over because the pot is so light, and that they sometimes retain too much moisture, particularly for plants that like a lot of air around the roots, such as Vanda. On the other hand, you don't have to water your orchids quite as often. Unglazed clay pots allow more air to the roots, especially "orchid pots" with extra airholes, but orchid roots tend to get stuck to them, so that getting plants out of them is difficult. To unpot an orchid from a clay pot, run a knife around the inside of the pot, or even break it. Clay pots will tend to dry out faster than plastic ones. Since most orchids in the wild grow as epiphytes, growing on tree branches, orchids are often mounted on slabs of bark, particularly cork bark, or pieces of tree fern fiber. These plants tend to need daily watering, but for orchids that like a lot of air at their roots it's hard to beat. It's very difficult to get plants off of a slab without significant damage to the root system, so if they outgrow their current slab a useful repotting technique is to tie the current slab in front of a larger one with fishing line. Orchids are sometimes potted in baskets made either from plastic mesh or teak, a type of wood. This allows lots of air to get to the roots, but tends to make plants dry out more quickly. For orchids such as Stanhopea where the flower stems grow downward through the pot and come out the bottom, these have obvious advantages! Roots tend to stick to teak baskets much as for clay pots; I have often seen Vandas planted in a number of nested teak baskets of different sizes, rather than taking them out of their current basket when they outgrew it! Plants grown in teak baskets often have no potting mix, but grow in the pot as if it were a slab. You should also check out the information on pot size on the repotting orchids page.